Musical Glitter Globes, Musical Dolls, Eggs, and Wall Clocks. Experience the combined splendor of three artistic legacies! This exquisite Peter Carl Faberge-style musical egg is a magical tribute to a holiday classic, "The Nutcracker Ballet", and features an all-original design showcasing masterful Russian Palekh artwork! Inside you'll find a delicate enameled pewter Clara ballerina figurine. Gleaming 22K gold scrollwork and sparkling simulated gems lavishly adorn the base, Clara figurine, and the egg! This exclusive, limited-edition Peter Carl Faberge-style musical egg from Ardleigh Elliott is handcrafted of Heirloom PorcelainÂ®, and plays Tchaikovsky's classic melody, "Dance of the Sugar Plum Fairy". A first-of-a-kind Nutcracker ballerina music box that's sure to excite strong demand amongst discerning collectors - order now! The magic of The Nutcracker Ballet comes to life in this extraordinary Peter Carl Faberge-style musical egg! An exclusive limited edition from Ardleigh Elliott, this collectible Nutcracker music box celebrates three artistic legends - The Nutcracker Ballet, the black lacquer artistry of the Russian Palekh masters and the magnificent style of Peter Carl Faberge - in one stunning work of art you'll treasure for a lifetime.Expertly handcrafted of fine Heirloom PorcelainÂ®, this collectible egg-shaped music box showcases colorful scenes from The Nutcracker Ballet. A special surprise awaits you inside the hinged egg - an enameled pewter sculpture of the Nutcracker Prince! 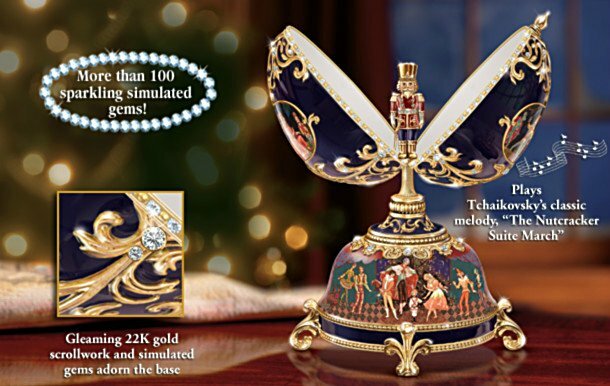 Gleaming 22K gold accents, scrollwork, and sparkling simulated gems give this collectible Nutcracker music box a magical shimmer, and as a final touch it plays Tchaikovsky's "The Nutcracker Suite March". Don't wait - strong demand is expected for this breathtaking limited edition, so order now! Anyone who shares their life with a cat knows that each is a unique individual who can never be replaced. Each one comes into our lives and makes their own special place in it. Now, celebrate what your sweet kitties mean to you with the Kittens Leave Pawprints On Our Hearts Glitter Globe featuring the beloved kitten portraits of acclaimed artist Jurgen Scholz. A Bradford Exchange exclusive, this kitten glitter globe is simply purr-fect for any cat lover. Masterfully crafted, the Heirloom PorcelainÂ® base of this musical treasure is decorated on all four sides with Jurgen Scholz's sweet kitten art, highlighted by warm, 22K-gold plating and hand-set sparkling faux jewels. Inside the glitter globe an adorable kitten sleeps within the heart-shaped "O" of the word "LOVE", symbolizing all that our feline friends bring into our lives. Shake the glitter globe and a shower of silvery glitter pours down over the sweet kitten. Plus, the touching melody "Always In My Heart" plays at the turn of a key. Makes a charming kitten gift for any kitten lover or great addition to your snow globe collection. Strong demand is expected, so don't delay. Order now! The Jingle Cats are a pop culture sensation, using nine real kittens that recorded a Billboard Top Ten Album in the 90s, and their mew-sic is still going strong! Now, the Jingle Cats kitten voices are united for the first-time ever with the beloved imagery of famed artist Jurgen Scholz in this A Meow-y Christmas to All Tabletop Christmas Tree, a limited edition exclusively from The Bradford Exchange. This charming tabletop tree is lavished with festive green and red ornaments, 15 glowing LED mini-lights and an illuminated sculptural topper. Sitting in front of the Christmas tree are three hand-cast and hand-painted kitten sculptures that capture the wide-eyed wonder of artist Jurgen Scholz's famed cats. Each cat features golden halos, sculpted ribbon-style collars, jingle bells, festive bows and wings decorated with soft-as-silk Maribou feathers. Together, each cat meows "Silent Night", "Deck the Halls", "Oh Come All Ye Faithful", and more as lights on the Christmas tree blink to the beat of the music. High demand is expected, so order now! It has been said that music is the language of angels. Now you can be transported to a world where heavenly angels abide and musical melodies soothe your spirit with the Expressions of the Soul Fantasy Doll, a collectibles first exclusively from The Ashton-Drake Galleries. The vision of two artists, acclaimed fantasy artist Nene Thomas and award-winning Master Doll Artist Renata Jansen, come together in this incredibly realistic, fully sculpted and hand-painted doll playing the violin. Hand-cast in collector-quality artist's resin, the perfect medium to flawlessly capture every nuance of Renata Jansen's sculpting, this glorious heavenly beauty is inspired by Nene Thomas's enchanting original painting "Lullaby". With flowing locks of silken hair, delicate features, graceful wings and billowing layers of luxurious fabrics that shimmer in the light, this angelic fantasy doll is sure to enchant. Cascades of delicate flowers, adorning her hair and magnificent gown, add to this fantasy doll's breathtaking beauty. In her delicate hands, she holds an intricately detailed, sculpted violin and bow. At the touch of a button, she plays ethereal violin music to soothe your soul. Impressively sized at 19" tall, this magnificent musical doll is sure to capture your imagination. We expect high demand for this collectibles first collaboration by two acclaimed artists, Nene Thomas and Renata Jansen. Therefore, you are urged to order now! There's no greater joy than providing a precious baby with every comfort, wrapping her in luxury and surrounding her with love. Now the You Are So Beautiful Baby Doll beautifully personifies those special moments. Created by award-winning Master Doll Artist Linda Murray, this incredible baby doll is a So Truly RealÂ® Signature Edition exclusively from The Ashton-Drake Galleries. She is so abundant in artisan details and delightful accessories that only 5,000 will ever be created! Plus, you'll know your baby doll is a genuine Signature Edition doll because she has a special doll stamp etched into her neck, a golden logo tag stitched into her costume, AND a Signature Edition Certificate of Authenticity. This So Truly Real baby doll is handcrafted of velvety soft RealTouchÂ® vinyl, with hand-painted features and a weighted body that feels incredibly real in your arms. Her hand-tailored outfit includes an embroidered ecru organza and blue cotton dress, lacy bloomers, knit slippers and a floral headband. This Signature Edition doll even comes with a white wicker basket, teddy bear, soft fleece blanket and a musical pillow that plays the melody of "You Are So Beautiful". Strong demand is expected for this limited-edition Linda Murray baby doll, so don't delay. Order now! Master Doll Artist Linda Murray is internationally recognized for her ability to bring baby dolls to life through sculpture. Now, inspired by the miracle of the Nativity, Ms. Murray brings us a newborn Baby Jesus doll that perfectly expresses the wonder of faith. Introducing the Jesus, The Savior Is Born Baby Doll, a breathtaking Signature Edition Doll exclusively from The Ashton-Drake Galleries and available in a strictly limited edition of only 95 firing days worldwide. At about 18 inches long, this stunning baby doll is about the size of a real newborn and is so realistically sculpted by Linda Murray that when you look into his sweet face you're sure to be touched by the loving gift of the Baby Jesus. Beautifully crafted of fine porcelain to recreate all the wonderful details the artist intended, this exquisite baby doll has completely hand-painted features, framed by wisps of baby-soft hair and crowed with a shimmering golden halo. Even his long baby eyelashes and tiny, hand-painted fingernails and toenails look lifelike. He arrives in a magnificent cream-colored gown with embroidered golden trim, along with a red velvet blanket lined in golden fabric and adorned with more golden trim. His matching red velvet pillow is musical, filling the air with the soft melody of "Away in a Manger". In fact, your Baby Jesus doll even comes with a special remembrance of the Nativity; a decorative "hay"-lined manger, hand-stained with a rich mahogany finish for lasting beauty. Demand for this limited-edition doll is certain to be extraordinary, so don't wait. Order now!